The finals of the horticultural knowledge contest among universities in Beijing took place yesterday at the Beijing Normal University. The student team from Beijing University of Agriculture claimed the title. Six teams of contestants made it to the finals, including teams from Beijing University of Agriculture, Beijing Normal University, University of International Relations, Beijing University of Posts and Telecommunications and China Women's University. They competed on their knowledge of ecology, international horticulture and the expo host, Yanqing. The contest was held with the aim of getting more people involved in and familiar with the upcoming Beijing International Horticultural Exhibition that will run from April 29 to October 7 in northwestern Beijing's Yanqing district. Around 110 countries and organizations have registered to participate in the exhibition, which showcases the importance of nature, plants and ecology. The contest was the last part of a campaign to promote the international expo. 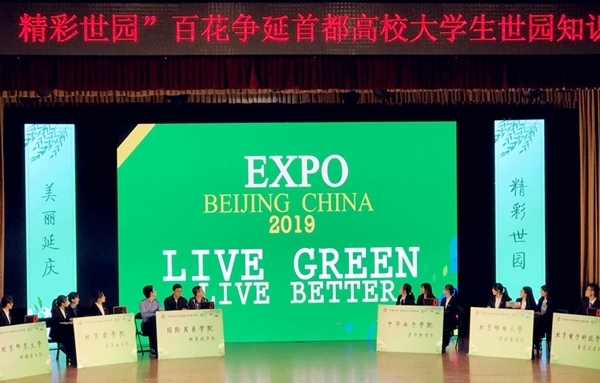 This was organized by the Beijing World Horticulture Expo Coordination Bureau, in conjunction with the government of Yanqing district, the host of the 2019 World Horticulture Expo, and the Beijing Commission of the Communist Youth League. More than 1 million students from 92 universities participated in the campaign, which features ten different types of activities. These include a horticultural knowledge contest, singing competition, dance competition, painting contest and a Yanqing homestay tourism design competition. Each contest is represented by a flower such as the lily, peony, rose, jasmine and camellia.